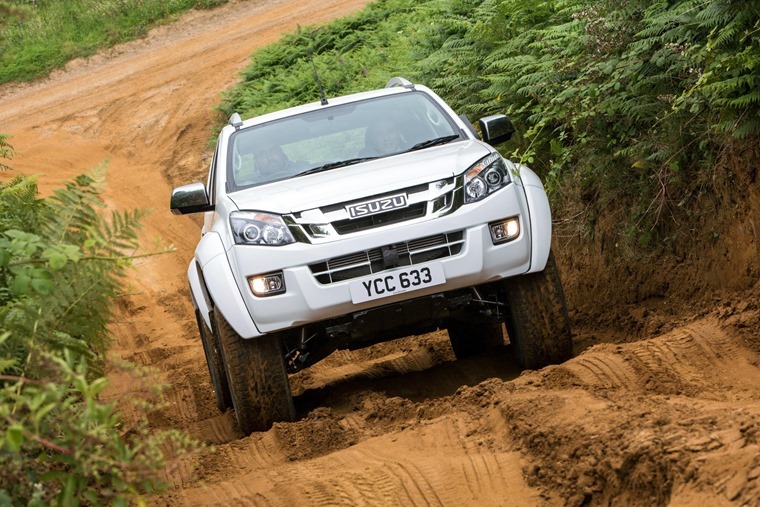 Mother Nature could throw whatever she wanted at the Isuzu D-Max AT35 and it would simply shrug it off with contempt - deep mud, steep hills, even rivers proved nothing more than mere distractions. The AT35 is probably the most capable off-roader this side of a John Deere tractor. Sometimes you have to wonder what goes on in manufacturer’s heads. The Isuzu D-Max is a fine pickup truck, a near indestructible device that errs towards utilitarian rather than glossy lifestyle and is therefore favoured by those in rural locations. Deep mud, steep hills, even rivers proved nothing more than mere distractions for the AT35. I was outside of my comfort zone, but well within the capabilities of the truck. This saw them proceed to jack it up by more than six inches, and proceed to then fit longer suspension complete with Fox Performance dampers and mammoth 35-inch tall Nokian Rotiiva all-terrain tyres. To accommodate the excess of rubber, the wheel arches also had to be widened dramatically. Combine all that with extra height and a bold chrome grille, and all of a sudden the D-Max has a road presence unlike any other vehicle. Frankly it makes even the Land Rover Defender look a bit pedestrian. 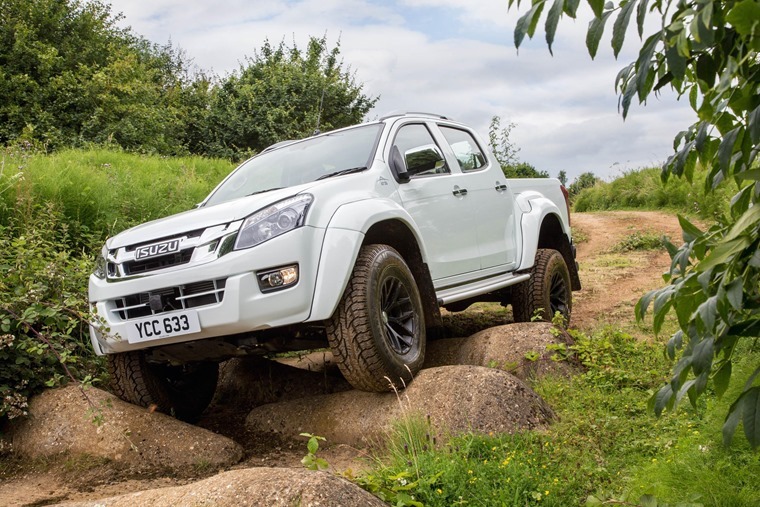 The AT35 is all based around the standard D-Max Utah, but these modifications add a hefty £14,000 to the price tag. For that price increase you do get something that is probably the most capable off-road vehicle this side of a John Deere tractor. 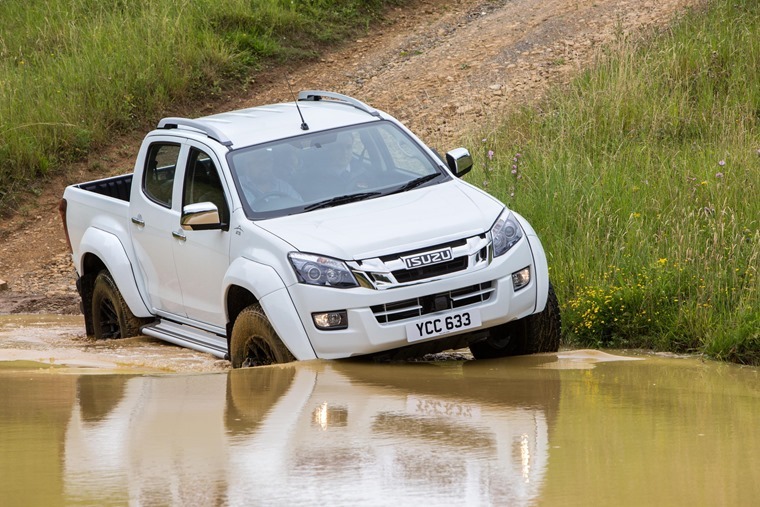 My home county of Cambridgeshire isn’t exactly renowned for its mountainous terrain, so the Isuzu came with me on a trip to the Peak District where, as fate would have it, I eventually found myself in a surprisingly steep yet boggy field. It was midday, but the blackest rolling sky curled up like the wild sea, making it feel like dusk. Outside it was below zero, with a wind chill to take the skin off, and snow was flying past horizontally. Normally I’d be pining for the generic bland weather of the east and a warm cuppa, but the work done by Arctic Trucks meant that, on this day, I felt invincible. Mother Nature could throw whatever she wanted at the D-Max and it would simply shrug it off with contempt. Deep mud, steep hills, even rivers proved nothing more than mere distractions for the AT35. I was outside of my comfort zone, but well within the capabilities of the truck. I’m not sure anything outside of a purpose built course would worry the Isuzu in any way, but there sadly wasn’t one handy. Instead, once I’d found my way out of the grey abyss, I had to stick to city roads and motorways. Drive through the city and I’m pretty certain it would be possible to do that in the most literal sense - and the sheer bulk of the car makes it feels a tad unwieldy. However the stance of the thing ensures that everything moves out of your way, and I mean everything; white vans, cyclists, even proper HGVs all kowtowed to the might of this AT35 and pulled out of the way. Whether that was out of fear or respect remains to be determined, but either way it made life easier. The volcanoes of Iceland are as demanding as Cambridge Park and Ride to this thing, and it’s not entirely happy being stuck in suburbia. Despite the king-of-the-road sensation, those huge tyres and that special suspension doesn’t really translate to good on-road behaviour. Every bump thuds through the cabin like a sledgehammer, while the body leans often dramatically in corners. That at least warns you that the back end is about to lose grip, sliding sideways with the same grace as a Titanic-destroying-iceberg would. It gets no better on the motorway where the ride never fully settles down while the tyres generate a huge amount of roar. If you’re after a serene drive, you best look elsewhere. But to do so is to miss the point of the AT35. It isn’t designed to be confined to the city, and more fool you if that’s what you’ll be spending your time doing, but rather it’s intended to tackle Eyjafjallajökull and win. The volcanoes of Iceland are as demanding as Cambridge Park and Ride to this thing, and it’s not entirely happy being stuck in suburbia. The stance of the thing ensures that everything moves out of your way, and I mean everything. 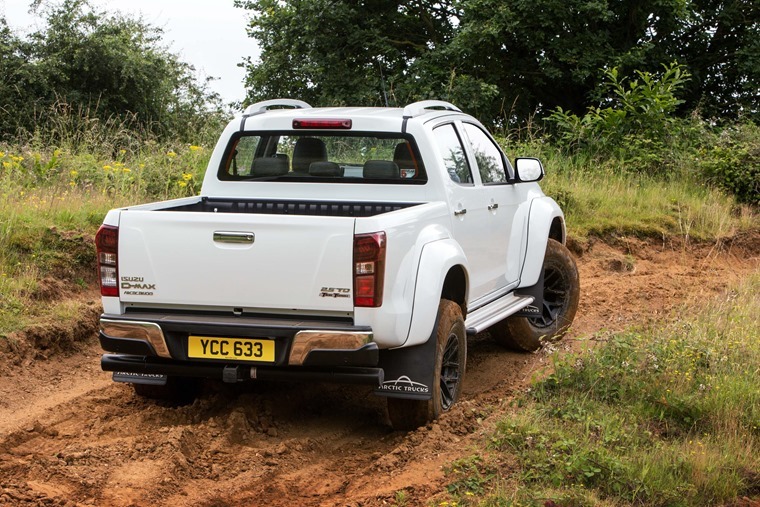 Now that the Land Rover Defender has ceased production, there’s nothing out there that can compete with the D-Max, either in terms of off-road abilities or charisma. The Peak District might not be the toughest test that this truck will ever face, but the very fact that I was confident enough to go axle-deep into the muddy backwaters of Derbyshire without any kind of backup demonstrates how driving the AT35 really does make you feel unstoppable. More than that, it makes you feel like every day could be an adventure. It rarely will be, but it just could happen and you’d be ready. Sitting in the D-Max in the middle of that field, I had no real idea of where I was, but I knew where I was going. Making sure four-wheel drive was switched on, I pointed at the horizon and made my own way to wherever my destination was going to be, happy that Mother Nature could throw whatever she wanted at the D-Max and it would simply shrug it off with contempt.